Each month we choose a casino game from a few best tablet casinos, iPad casinos of Android casinos. This month we selected Unibet Blackjack table/card game. A nice game with good features for tablets and smartphones. 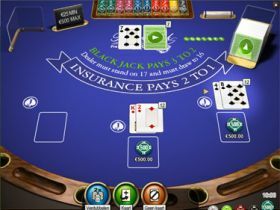 The game of the month at Unibet is Blackjack, a fantastic card game which you’ll need luck and a some skills for. The Unibet Blackjack game on the tablet and mobile is simple and clear. It has little and big buttons: “Back To Lobby”, “Options”, “About”, “Bet Select”, “Deal”. When you turn the tablet or mobile, the design of the game fits easily. The buttons and the other items will be properly and clear placed in the screen. The possible bets are from ₤2 to ₤200. Do you want to play Unibet Blackjack? Click here to play the game at Unibet. , one of the best iPad casinos and Android casinos in the world. Stand (no cards will be given to you and you hand over the turn to the computer). Hit (a new card will be given to you, so you can get closer to 21). Double down (double your bet and a new card will be given to you). Split (this options is only shown if you have two cards with the same value. With this option you can split your cards and play further with 2 card piles). All cards with a number written on it (2 to 10) have as point value the number written on the card. Cards with pictures (Jacks, Queens and Kings) have a point value 10. The Ace has as point value 11 or 1. You can choose the value yourself. But if you have for example an Ace, a five and a nine, the Ace will automatically count as 1. Because if it doesn’t, you’ll lose automatically. Select your bet – Select the amount you want bet. Deal – The cards will be given to the player (you) and the bank/dealer. Choose option – Choose from the shown options: “Stand”, “Hit”, “Double down” and “Split” (in special situations). Choose new option – Choose from “New bet” (to select a new amount to bet in the next round) and “Same bet” (to use the same bet as you used the previous round). Do you want to try your luck? Click here to have a try.